Dwarf Coconut trees or dwarf coconut palms. Coconuts are widely grown throughout the world. 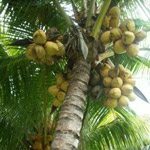 Every part of the nut is useful – not only is the white fleshy part a very nutritious food and coconut water a delicious drink; fibres can also be used for making rope, leaves are useful for baskets and roof lining, wood can be used for furniture & building…. Just to name a few of the many benefits of the ‘Tree of Life’. Dwarf Coconut Trees are now opening up possibilities for gardeners. In ideal conditions, a dwarf coconut can flower as early as 3 years of age, with first fruits at 4 years. 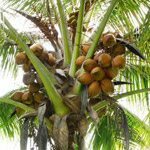 Coconut Palms produce new inflorescences every month, bearing up to 250 fruits a year, though 160 is more common in good conditions. They are high yielding, with a larger volume-to-husk ratio than the tall varieties, and fruits are sweeter due to higher sugar content. The Malayan Green Dwarf reputedly has the sweetest water for drinking. Other varieties include the Spicata dwarf; which has stalk-less fruit, attached straight to the branches, the Village dwarfs; very compact and small enough to grow in containers, the Malayan Yellow dwarf with beautiful light flavoured fruits, and the Giant Green dwarf with a full size crown, but compact trunk. Both the Malayan and Spicata dwarf come in various colours such as Green, Golden, Red & Yellow, and these colours mainly refer to the fruit colour, or ornamental value. 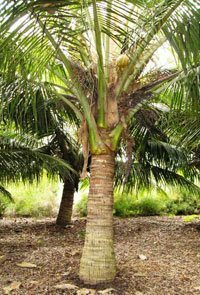 Up to now, the best known Coconut Palm was the tall variety. This tall variety represents the majority in commercial production; due to a higher copra yield. 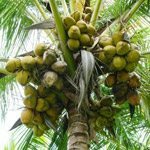 Copra is the meat; or kernel, of the coconut, which an approximate composition of Oil (64%), Sugars (16%), Protein (7%), Water (6%), Fibre (5%), and Minerals (2%). Copra is used to produce coconut oil. Tall Coconuts also generally have a longer life span, with and expected 80-120 years, in comparison to 40-60 years for dwarves. Dwarf Coconuts may be a more suitable solution for backyards around Australia. They are generally precocious, meaning they mature very early, with a much slower growth rate. In comparison to the expected 30m+ for a tall coconut, the slow growth and smaller overall proportions of the dwarf coconut are well worth considering. Dwarf Coconut Palms are best planted below ground level to encourage a deep, low root base which increases stability, and keeps fruits at a low level for a longer period of time. 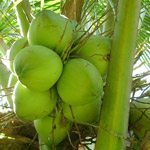 Dwarf Coconuts do not form a large bole at the base of the trunk, making them less resistant to strong winds than the tall variety. Prepare your planting site; or pit, well. Add lots of rich, organic matter, and use a pit which can be mulched heavily. Sandy soils are generally preferred, but not essential if a good pit is dug. Good drainage is crucial, as is fertiliser for good growth. Feed your palms regularly with a good quality NPK fertiliser, in proportions similar to 8N:1P:16K. NPK ratings are available on all fertiliser packaging. Avoid planting your coconut palm during the peak of the wet season if you are in the tropics, and provide shade for your seedlings for the first few years. Protection from livestock may also be required. There is no need to bury the coconut, just keep adding lots of mulch and water.